Alfajores are a small round cookie invented in 1948 in Buenos Aires by Demetrio Eliades, Benjamin and Luis Sisterna Sbaraglini. They founded the company HAVANNA based in Mar del Plata (Argentina). Havana comes from Havana, capital of Cuba, the country of origin of the founders. We tried this dessert for the first time in 1974, when my aunt Giuseppina emigrated to Argentina returned for the first time in her birthplace. This pastry, wrapped in golden foil, is soft and fragrant with a subtle meringatura that covers the whole cookie, while the cream “dulce de leche” surprises you in flavor and texture. This cookie is liked by all. 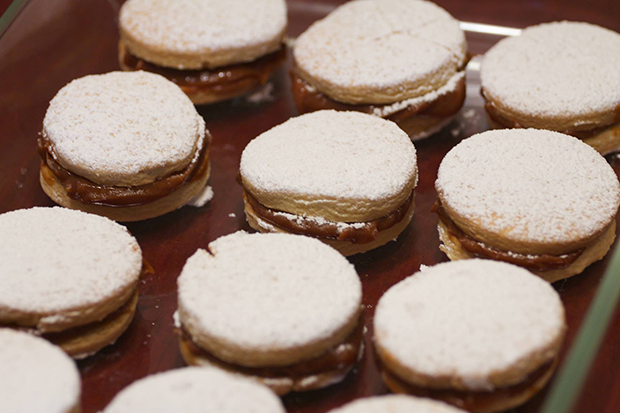 Since 1974, Aunt Giuseppina has returned many times to visit us and every time she brings alfajores. Last year, to meet the needs of all the brothers and nephews she reduced the amount of things in her luggage to the minimum possible so that she was able to bring several boxes of these cakes which was very much appreciated. The company also produces other Havanna pastries that she always wanted us to try but our favorite remains the alfajores with white meringue. Ten years ago I went with my husband to go and see the plant close to the Mar del Plata. It was very interesting to know the place where they are produced and hear the story. Colleen also acquired this passion for alfajores and when she found the recipe in the United States wanted to try it. The recipe that I present here was made by her. The cream filling is also easy to find in our supermarkets in the section devoted to jams (dulce de leche). It is appropriate to use a smooth round cutter for shaping the dough of about 5 cm. Mix together the flour with the baking powder and baking soda. In a bowl, cream the butter with the sugar and salt until it is firmly attached. Add the egg yolks, vanilla, brandy and mix again. Stir in the flour mixture as soon as possible and work with your hands until it forms a ball. Wrap in plastic wrap and let stand in refrigerator for one hour. Remove the dough from the refrigerator and roll out with a rolling pin after the floured work surface and the dough itself to a height of 1 inch. With a size of 5 cm about pasta form of diskettes. Reassemble ball leftovers and proceed to roll out and cut circles. Line a baking tray with baking paper, place a portion of the disc, bake for 14-15 minutes in the middle of the oven. Then dial the pastry discs putting up half the cream and cover it with another pressing lightly. Finally add a dusting of powdered sugar.